Travel becomes a breeze when you reserve at Residence Inn Kansas City Olathe. Our extended-stay hotel is ideal for leisure and business travelers who want to feel at home during their stay. We're located near popular attractions including Stone Pillar Vineyard & Winery and Oak Park Mall. 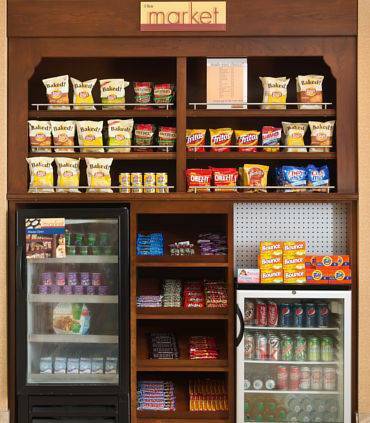 Large corporations close to our hotel include Exxon, John Deere, CenturyLink, Husqvarna, Pepsi, Aldi and Garmin. Upon arrival, retire to our spacious suites appointed with fully equipped kitchens, distinctive living areas and ergonomic workspaces. During your stay, enjoy complimentary high-speed Wi-Fi and a full hot breakfast buffet. After a day full of sightseeing, unwind at the outdoor courtyard where you can grill or sit by the fire with snacks from The Market. When downtime arises, head to our fitness center for a brisk but meaningful workout and then visit our indoor pool and jacuzzi for a refreshing dip. Stop by the front desk and ask a friendly team member for advice on visiting exciting local attractions!